I want to talk today about two brave Japanese woman who share a lot in common. There were both announcers — in fact, they were represented by the same talent agency. They both suffered from cancer. They both lost their battles at approximately the same age. But most importantly, even though the disease consumed their bodies and ultimately took their lives, neither woman ever let cancer consume their spirits. You may have heard of Koyabashi Mao (小林麻央). Her blog about her fight against cancer is well known in Japan, and her story was broadcast by the BBC and other Western media outlets. You’ve likely never heard, however, of Kuroki Nana (黒木奈々). As far as I could tell, she received no attention in the English speaking press. Even many Japanese people I speak with don’t know her story. But her tale is an equally beautiful example of how a human being can live out her last days in love, laughter, and pride. Kobayashi Mao was born in 1982 in the city of Odiya in Niigata Prefecture, north of Tokyo on the main island of Honshuu. She dreamed of being a famous actress like her idol, Suzuki Kyouka, who has starred in dozens of Japanese films and TV series since 1989. But while she was in college, her older sister Maya encouraged her to appear on Koi Kara Sawagi (恋から騒ぎ; Much Ado About Love), a variety program where young women are brought on to discuss their luck (or lack thereof) in romance. Contestants told stories about their experiences, and one was selected for the host’s 説教部屋 (Lecture House). Mao ended up being selected for confessing that, at age 19, she still hadn’t done it with anyone. The appearance convinced Kobayashi that she wanted to speak in public, and meet as many people as she possibly could. Soon after, she enrolled in announcing school and set about building a career as a free announcer and journalist. Her career led to a job with Ni-Tere’s NewsZERO where, in December 2008, she interviewed Ishikawa Ebizou (石川海老蔵), the son of a famous Kabuki actor who decided to follow in his father’s footsteps and become the 11th person to take the stage name of Ishikawa Ebizou, a professional name in the Kabuki world dating back to 1660. Their marriage was described by one article on the site LiveDoor as a “speed marriage” (スペード婚); the two were revealed to be dating the next year, and by March 2010, they were happily married. The next month, her big sister Maya revealed on the variety program SMAP X SMAP that the two had only dated for half a year before heading to the altar. Maya said that Mao described Ebizou as “my destiny” (運命の人; unmei no hito), which made a quick marriage a no-brainer. The two were happy married for four years when, in 2014, a routine medical examination found something that Mao’s physician described as having a “50–50 chance” of being breast cancer. Follow up appointments confirmed that the disease wasn’t only in her lymph nodes, but had advanced to her lungs and bones as well. “No way,” Mao later reported thinking as she cried over the diagnosis. The couple kept the news of Mao’s disease under wraps until 2016, when it was divulged by a sports paper. Ebizou held a hastily arranged press conference to confirm the diagnosis. But Mao also wrote about the more serious side of her disease, and also composed moving posts about how the disease had changed her perspective on life. “But I really didn’t have a chance to look!” I thought. This was the first time I’d met someone who’d say things like that. I would smile as if saying, “Oh, yeah!”, but I didn’t really feel it deeply. But I smiled like I did (heheh). Even though I looked at the sky from my hotel room every day, there was never a day it moved me. But it seems to me the sky I see is fine even if it’s all dark and stormy. Unfortunately, Mao’s struggle only became more and more difficult. Her cancer was diagnosed as Stage 4 shortly after her first blog post. On May 26th, 2017, she posted a photo in her blog (visible to blog platform members only) that showed a bandaged, malignant growth bulging from her chin. By June, she was reporting high fevers, pain, and an inability to sleep well. Mao’s final post was on June 20th, 2017 — a picture of fresh squeezed orange juice that her mother had made for her. Good morning. These past few days, I’ve been drinking fresh squeezed orange juice every morning. To be precise, I don’t have the strength to squeeze juice myself, so I look forward to when my mom wakes up and makes it for me. Lately, the sweet, tart deliciousness of orange juice has triumphed over the pain of stomatitis! I can greet each morning with a smile. Sending my wishes that everyone else can smile today. Kobayashi Mao passed away at her house on June 22nd, 2017, at the age of 34. After her death, most of Mao’s posts were translated into English — most likely by her husband, who occasionally posts in English on his Instagram account. Ebizou publicly grieved his wife’s death in a highly emotional press conference shortly after her passing; many newscasters and commentators also openly wept in the ensuing days while discussing their memories and encounters with Kobayashi Mao. In February 2014, a routine exam found a lump in Mao’s chest. Her doctor, instead of recommending a detailed examination of the lump’s cells as a next step, suggested a followup exam in six months. Mao’s next exam was eight months later, by which time the cancer had spread to her lymph nodes. If she had taken treatment at this point her five-year survival outlook would have been 90%, and while the hospital recommended the standard treatment, it’s said that Mao declined. The standard treatment consists of surgery, anti-cancer drugs, radiation, hormone therapy, and molecular therapy — in other words, the standard treatment anyone thinks of when they hear of a case of cancer. Reports began to pop up in weekly celebrity magazines that Kobayashi — possibly at the urging of her husband, who was active in Feng Shui and other forms of spirituality — had refused standard medical treatment, and were relying exclusively on non — invasive (non-surgical) procedures. Even a year later, comments and well wishes continue to pile up on Mao’s blog, with people leaving behind their memories of the newscaster whose positive attitude inspired millions around the world. Just last week, on the one year anniversary of Mao’s death, Asahi Shinbun published a piece on cancer blogger pumiy, who, inspired by Mao, is now sharing her story with an audience of thousands throughout Japan. Like Kobayashi Mao, Kuroki Nana left behind an extensive written account of her battle with cancer. Much of what follows below is taken from Nana’s book, I’ll Leave the Future to My Future Self: The 31-Year-Old Newscaster with Stomach Cancer. Kuroki Nana was born in 1985 in the city of Kagoshima in Kagoshima Prefecture. Nana knew from elementary school that she wanted to be an announcer, and she geared her schooling toward pursuing a career as a newscaster. Nana attended Sophia University, where she studied French, and she attended school in France for a year as an exchange student. Prior to graduation, she attempted to land a job, but was rejected time and time again, leading her to a point of despair. After being rejected for a newscaster position by broadcaster MBS, someone from their HR department suggested that Nana consider taking up a job as a behind-the scenes reporter, and using that as a route to on-air newscasting. After considering whether to try for a newscaster position at a local affiliate, Nana opted to enter MBS as a reporter so that she could stay affiliated with a station in a major metropolitan area. One of her first jobs was the thankless position of がん首取り (gankubidori), which involved knocking on doors and contacting the relatives of people involved in accidents or crimes in order to secure head shots of them for use in broadcasts. It was exhausting work, and years later, Nana recollected how her boss would chew her out whenever competing stations managed to secure head shots before she could. Nana eventually managed to land a job on NHK BS’s International Report (国際報道) as a “sub-caster” (co-anchor). Three years later, her knowledge of English and French led her to a main anchor position alongside her colleague, Arima Yoshio, where she used her multilingual capabilities to interview experts from around the world. 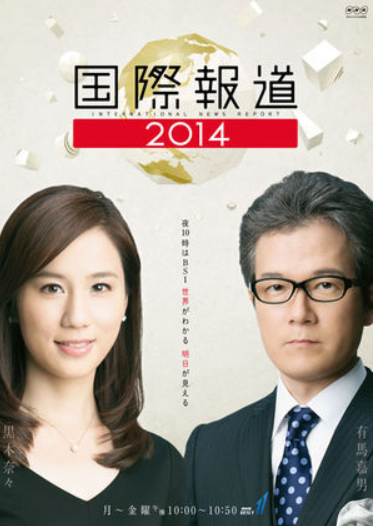 A poster for International Report 2014, featuring newscasters Kuroki Nana and Arima Yoshio. Suddenly a sharp pain bolted through my stomach. I instinctively cradled my stomach and doubled over in my chair. I was assailed by an overwhelming pain that felt like my organs were being directly crushed. “All of a sudden, some sort of pain…hold on, I’m gonna go to the washroom,” I told my friends. If pressed, I can’t say I can’t drink alcohol; to the contrary, I love it. There’s no way this pain came from a single glass of champagne. I forced myself to put on a cheery face, stood up from my seat, and headed for the washroom. I endured my pain in front of the sink. I saw a glimpse of myself in the mirror. My face had become so blue, I couldn’t think of it as my own face. It was a color I’d never seen before. A cold sweat poured our and drenched me. What’s wrong with me? I thought, as another piercing pain came, and just like that I lost consciousness, and fell with my body slumped against the sink. “Will I not be able to return to work while I’m taking the medicine?” I asked, and my doctor responded, “It depends on the side effects.” When I heard this, I didn’t feel the same fear I had before about not being able to work. I think if I’d heard this a month before, I’d have sunk into despair. I wanted to get back to work, to recover and to see everyone in their top spirits. But I had no conviction that I’d absolutely be able to return to work. I want to live so badly. I want to work, too. I want to get married, and have children. It may be greedy, but that’s why I fight on. Nana fought through her despair, and focused after the surgery on adjusting to life without a stomach. Her intestines now had to do the work her stomach had previously done. Surgeons had attached a supplemental bag to her abdomen so that she could receive nutrition at times she felt like she couldn’t eat. Slowly, Nana found her appetite begin to return. After talks with executives from the news station, everyone came to an agreement: Kuroki Nana would return to the airwaves on January 4th, 2015. Nana continued to rest as needed, and was careful about the foods she decided to challenge herself with, as she didn’t want to eat anything that would put her return to the airwaves in jeopardy. On January 4th, 2015, Kuroki Nana, looking to be the picture of perfect health, stood alongside Arima Yoshio, broadcasting international news as though nothing had ever happened. In March 2015, Nana returned to the airwaves in a full time capacity, and did her job diligently until July. But at the end of July, she was forced to step down again. Her cancer was back, and this time, it was spreading. Once again, Nana tackled recovery and healing like it was her full time job. Unfortunately, this time, cancer would get the better of her. Her condition continued to worsen. On September 19th, 2015, Kuroku Nana passed away at her home. Arima Yoshio broke the news of her passing on air, choking back his emotions every step of the way. Of course I have different things to worry about now, but I decided to believe that good things will come next for me, and I feel that, somehow, that’s proving true. In the important words of my close friend: “If you leave the future to future Nana, everything will be all right.” Just as she said, from here on, I’m leaving the future to my future self. Cancer is a disease that knows no nationality or borders. Consider making a donation to the American Cancer Society to contribute to the battle. Japan Monogatari is the Japan you don’t learn about in anime — stories about real people and events that often get little coverage in the English speaking world. Read more at JapanMonogatari.com, and follow us on Facebook.